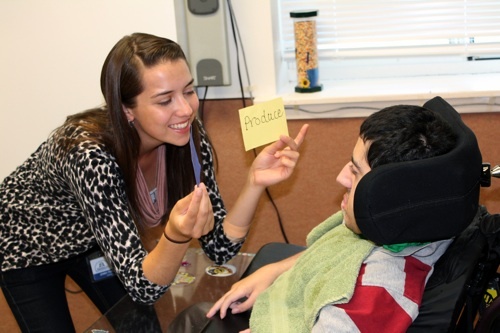 Jenny Pianucci works on communication skills with student Bruno Correia. Pianucci, who lives in Glen Gardner, recently received her MS in occupational therapy from Boston University. She has spent the last four summers as a teaching assistant in the Matheny School, and she will begin an OT internship at Matheny on September 24. This entry was posted in Uncategorized and tagged Jenny Pianucci. Bookmark the permalink.